Over three decades after its initial publication, Louis Fishers durable classic remains at the head of its class—a book that Congressional Quarterly called as close to being indispensable as anything published in this field. This newly revised sixth edition emphatically reinforces that sterling reputation. 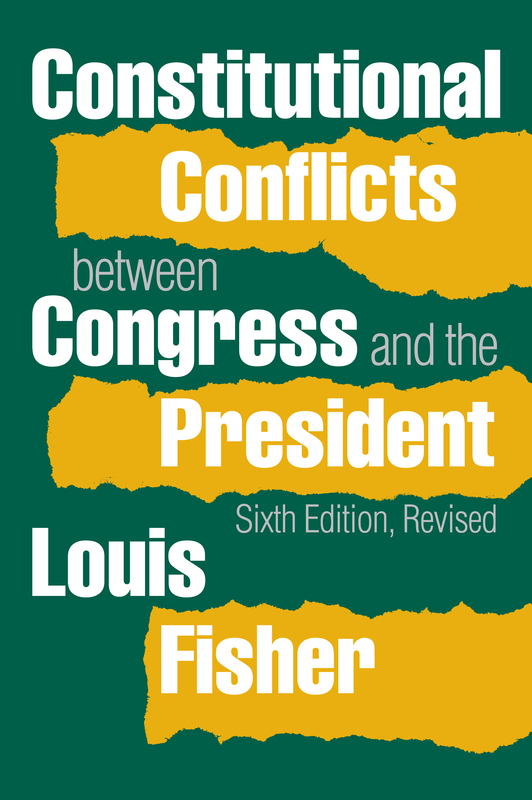 Fisher dissects the crucial constitutional disputes between the executive and legislative branches of government from the Constitutional Convention through President Clintons impeachment battles to the recent controversies over President Bushs conduct as commander in chief. He ventures beyond traditional discussions of Supreme Court decisions to examine the day-to-day working relationships between the president and Congress. By analyzing a mixture of judicial pronouncements, executive acts, and legislative debates, Fisher pinpoints the critical areas of legislative-executive tension: appointment powers, investigatory powers, legislative and executive vetoes, the budgetary process, and war powers. He then examines these areas of tension within a concrete political and historical context. Louis Fisher, Scholar in Residence at the Constitution Project, previously worked for four decades at the Library of Congress as Senior Specialist in Separation of Powers and as Specialist in Constitutional Law. His many books include Presidential War Power, In the Name of National Security: Unchecked Presidential Power and the Reynolds Case,,and Military Tribunals and Presidential Power, winner of the Richard E. Neustadt Award.